Many people carry it everyday, a smartphone. Have you ever thought it could be used as a scientific tool to help scientists know more about air pollution? iSPEX is an innovative way to measure tiny particles in the atmosphere, or atmospheric aerosols. These particles can be of natural origin, such as sea salt or tiny ash particles from forest fires or volcanic eruptions, through human-made soot particles produced by traffic and industry, and contribute to air pollution and its impacts on our environment and health in an as-yet poorly understood way. Atmospheric aerosols form one of the largest uncertainties in our current estimates of climate change, they could cause heart and respiratory disease, and in the shape of volcanic ash, they are of danger to air traffic. To assess their role and consequential effects, aerosols need to be measured with high spatio-temporal resolution. Present ground-based aerosol monitoring networks are limited in spatial coverage. Satellite-based aerosol monitoring is, despite its global coverage, limited in spatial and temporal resolution —with global coverage up to once a day with a ground resolution of a few kilometers only—, and lacks sufficient information on aerosol particle characteristics. Therefore, a different strategy is needed to overcome these current limitations. 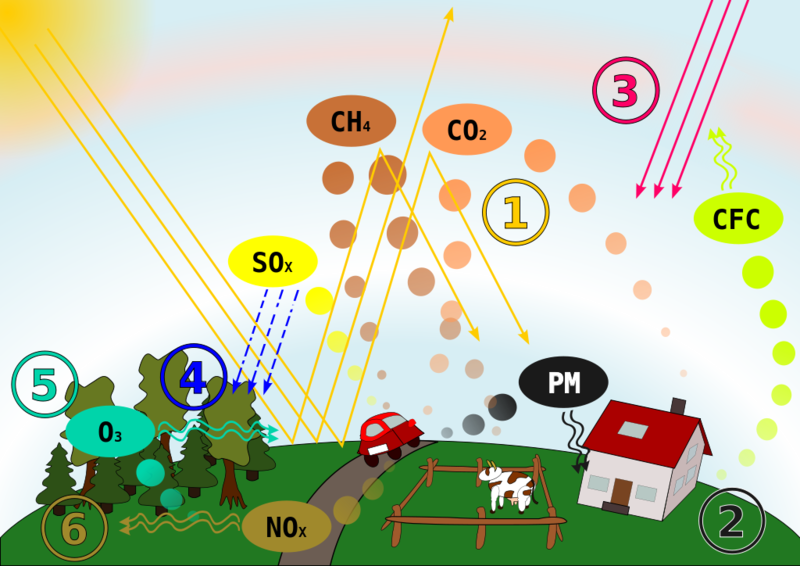 Schematic drawing, causes and effects of air pollution: (1) greenhouse effect, (2) particulate contamination, (3) increased UV radiation, (4) acid rain, (5) increased ground level ozone concentration, (6) increased levels of nitrogen oxides. Credit: Wikimedia Commons. The idea is simple. Click an add-on onto your phone, in front of its main camera, and it turns your phone into an optical sensor. The iSPEX add-on is a “spectropolarimeter” that, in combination with the phone’s camera, sensors, computing and communications capabilities can be used to measure atmospheric aerosols. iSPEX is developed building upon the measurement principles of its big brother, the Spectropolarimeter for Planetary Exploration, or simply, SPEX, a highly sophisticated instrument built for the observation of other planets and their atmospheres. In comparison to SPEX, of which there exist only a few in the world, iSPEX is simple and designed to be available and used by thousands of people, and it is primarily meant for the measurement of aerosols in our Earth atmosphere. iSPEX is currently available for iPhones 4(s) and 5(s) only. In order to measure atmospheric aerosols with your phone, you will need the iSPEX add-on and the iSPEX app. The app instructs participants to scan the cloud-free sky while the phone’s built-in camera takes pictures through the add-on. Each picture taken through the iSPEX add-on contains information on both the spectrum and the linear polarization of the sunlight that is scattered by the combination of molecules and aerosols in the atmosphere. The greater the quantity of aerosols present, the less blue and polarized the sky is. 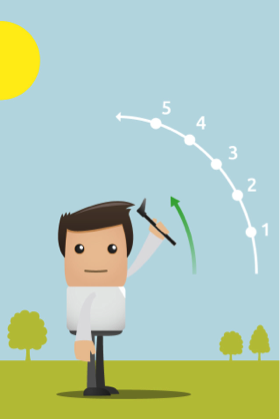 The data collected with iSPEX —spectrum and polarization as a function of scattering angle from the sun— provide unique information about the aerosol properties, including the amount of aerosol, the particle size distribution and the chemical composition. This type of information is crucial in assessing the impacts of atmospheric aerosols on environment and health. After each measurement, the app displays the preliminary result, a qualitative color-code of the sky condition on a live map, both in the app and on the project website. 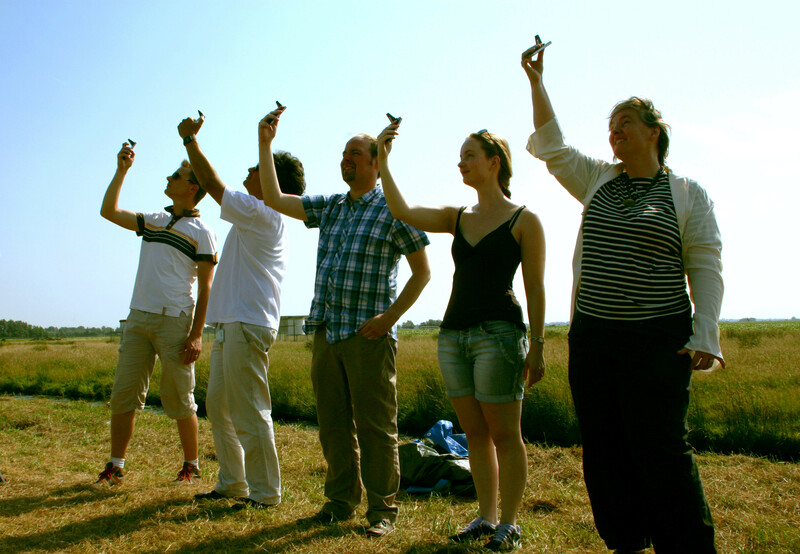 The data is then processed and further analysed by the iSPEX team to obtain maps of iSPEX-based aerosol information. 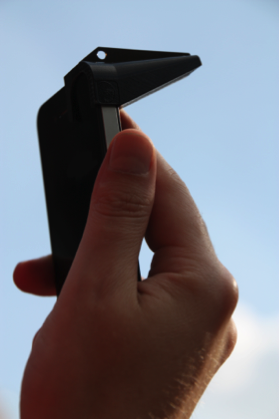 iSPEX allows for, in principle, anyone that is suited with the appropriate smartphone to be able to measure atmospheric aerosols at any location around the world at any daytime hour. Although a single iSPEX measurement may not be as accurate, a collection of many iSPEX measurements can provide information of scientific value —with the appropriate accuracy. As such, iSPEX can yield more information on atmospheric aerosols than is currently available. It is these features which make iSPEX not only a fun way for anyone to learn the science of atmospheric aerosols and their impacts on our daily lives, but also make a valuable contribution to on-going research on it at the same time. This we call citizen science! Dutch iSPEX team performing measurements. Credit: iSPEX. After an initial citizen campaign in the Netherlands in 2013, with thousands of participants and promising scientific results (1,2) we are now crossing borders and organising a first Europe-wide campaign: iSPEX-EU. From 1 September to 15 October 2015, thousands of citizens in ten European cities take to their streets, squares and parks to measure air pollution with their smartphone. Participating cities include: Athens, Barcelona, Belgrade, Berlin, Copenhagen, London, Manchester, Milan, Rome, and Toulouse. iSPEX-EU is organised as part of the EU-funded project LIGHT2015 and is one of the many activities running during the International Year of Light and Light-based Technologies 2015. 1 – Snik et al., Mapping atmospheric aerosols with a citizen science network of smartphone spectropolarimeters, scientific paper, Geophysical Research Letters, 2014, doi: 10.1002/2014GL061462. 2 – Land-Zandstra et al., Citizen science on a smartphone: Participants’ motivations and learning, Public Understanding of Science, 1-16, 2015, doi: 10.117709636625125602406. 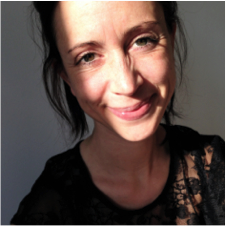 Elise Hendriks leads the present iSPEX-EU project and is based at Leiden Observatory, part of Leiden University in the Netherlands. From 2012 to 2014 she worked at the Royal Netherlands Meteorological Institute (KNMI) where she coordinated the Dutch GLOBE Aerosols project as part of the worldwide GLOBE Program. She holds a Masters degree in Physics, obtained at Utrecht University in 2001, and has a background in remote sensing of cold environments and applied research on air quality.